Our neighborhood groups change in response to our members interests. 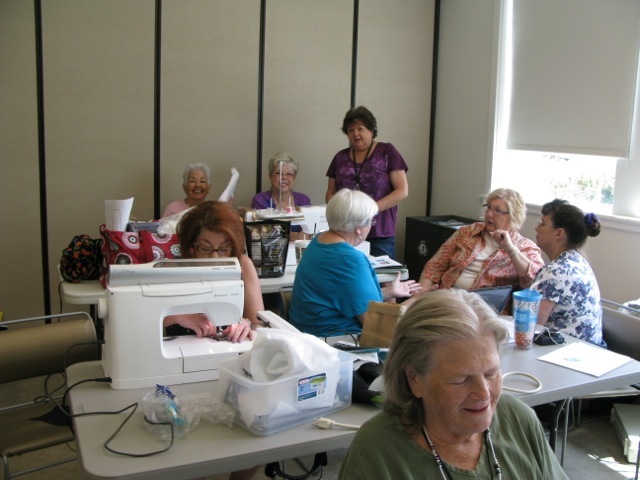 The Hoopla Sisters (machine embroidery neighborhood group) has grown to 35 ladies. The new morning meeting time is 10:30am and no lunch. We also have a new evening meeting at 7:00pm and no dinner. Both these meetings take place on the 3rd Tuesday of each month. Any member can attend either meeting or both meetings. Programs and format of the two meetings will be the same – just different ladies attending. These times will be in effect for 2015 – unless we combine the two meetings into one as needed. The program for the October 21 meetings will be: Everything you wanted to know about Embroidery Fonts. The meeting on November 18 will be one meeting at 11:00am and will be a holiday luncheon and embroidery gift exchange ( Chinese Auction). Everyone will be asked to bring a covered dish to share. The Pattern Master Boutique Software group has evolved into a Sewing and Technology Neighborhood Group. It will meet on the first Weds of each month beginning with a planning meeting on October 1st @ 6:30 pm at the home of Maggie Tinnin. Markita Gumble will be the group leader. Bring all of your technology related questions and ideas. We will discuss everything both hardware related and software related. Some topics will include blog writing, creation of designs for print your own fabric, pattern drafting software, quilting and embroidery software. Get your geek on and come play with technology. Beginning in January 2015, our last Saturday of the month meeting will become a hands on sewing technique group. Come for one or all meetings, the goal will be to build a notebook of fabric technique samples in this hands on (bring your machine) neighborhood group lead by Jami Roux. We continue to offer hands on programs for our younger generation in the TAG neighborhood group. We always love to have volunteer teachers and assistants!